Boxing Day Nitro Funny Cars Are Coming!! Well, we're about half way through the drag racing season here in Perth, which means only one thing. The Nitro Funny Cars are coming! At 6pm tomorrow, the four fuel floppers of Ricky Steffans, Fergie Donaldson, Damien Harris and Mark Sheehan will hit the track for the first of two meetings this season. Mark Sheehan is a well known name to many WA race fans, holding both the ET and speed records in Top Alcohol Altered. This team is well and truly capable of running a 4 second pass if the conditions are right. West Australian Damien Harris campaigned a Top Alcohol Funny Car before getting the call up to drive Paul Shackleton's Queensland based Nitro Funny Car. 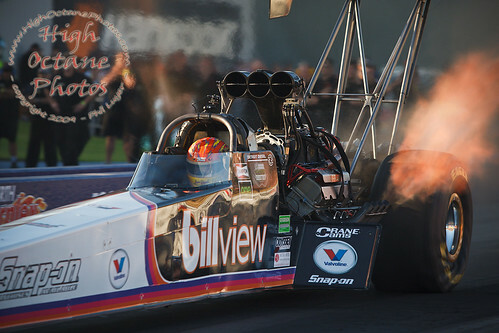 Harris is the only Australian Funny Car driver to dip into the 4 second zone so far, having run a 4.98 second pass at Willowbank in June, and the team will no doubt be looking to back that up with another 4 second pass on the other side of the country. Allan and Cheryl Greene's (now red) Greene Machine was driven by famous WA driver Allan Dobson for many years before he decided to move across to a regular Top Fuel drive with Santo Rapisarda Racing. Dobson helped to train Fergie Donaldson to take over driving duties in the Greene Machine, and late last season Fergie was awarded his Nitro Funny Car drivers license. This is Fergies first race meeting, and this team is certainly one to watch. Gates open at the Perth Motorplex at 11am tomorrow, and the first Nitro Funny Car pass is set for 6pm. 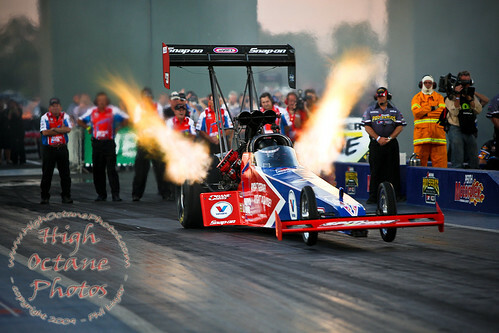 Top Fuel @ Perth Motorplex, originally uploaded by High Octane Photos. Congratulations to Martin Stamatis on winning the first of 2 rounds of ANDRA Pro Series Top Fuel Drag Racing at the Perth Motorplex this season. Stamatis dedicated his win to West Australian racer and engine builder Bob St Lawrence. Tonight was the opening night of the first of 2 ANDRA Pro Series rounds for Top Fuel at the Perth Motorplex this season. Phil Read grabbed the Top Qualifiers spot with a 4.69 followed by a 4.68.